Research into the patterns of commuting and migration – ‘flows’ – depends entirely on data from a Census, because only a Census in the traditional form is able to provide robust flow data covering all small areas. One consequence of any decision to curtail the Census would be that it would mean the end of over 30 years of policy use of Travel-to-Work Areas (TTWAs). TTWAs have since the 1970s been defined for the government by analysing the fine-grain commuting data from each new Census. So why is this important? Many policy decisions rely on comparing statistics on areas, so using appropriately-defined areas makes for better policy decisions: an area can miss out on large sums of public funds if the boundary around that area is not drawn appropriately. In the absence of TTWAs local data analyses rely on administrative areas, but their idiosyncratic boundaries distort the comparison of areas. TTWA boundaries are widely used by the UK government and others because they accurately map economic geography, and so allow comparisons of areas to be valid. Many recent urban or regional policies called for delivery by ‘functional economic area’ and the accepted definitions of such local economies is the TTWA. The following points illustrate just some policy-related current uses of TTWAs. •	Several series of Official Statistics are reported by TTWAs, some on a monthly basis, and these are widely used for labour market policy or analysis (as shown by ONS’s Nomis database supporting many thousand TTWA-based downloads each year). •	Government policy use of TTWAs includes guidance in the Treasury Green Book on how to assess the case for government intervention: TTWAs are cited in explaining how analyses should use areas that approximate local labour markets, and worked examples are given for one application, the assessment of proposed transport investments in Scotland (Transport Scotland 2008). •	The major policies that have for a decade focussed on cities was evidenced by the State of the English Cities research which relied on TTWAs (Parkinson et al 2006); recent key developments include the announcement of City Deals that based its choice of cities on TTWAs, even though the policy is explicitly aimed at local authorities (HM Government 2011). •	Local Enterprise Partnerships were created to represent functional economic areas and the relevant policy documents repeatedly reference TTWAs as template for such areas (HM Government 2010). A parallel development has been the need for housing market area (HMA) definitions so that housing policy is implemented across appropriate sub-regions (which potentially cut across administrative boundaries). Research for the National Housing and Planning Advice Unit has identified consistently-defined HMAs following analyses using small area data on migration as well as commuting. Even though the coalition government has shifted the scale of housing policy, it recognises that “[t]hese areas will help local planning” (Department of Communities and Local Government 2010). There are no effective alternatives to the Census providing data on local flows of commuting or migration. Experiments by ONS to see whether APS could provide the data on commuting needed to update TTWAs found that reliable results were unobtainable. Alternative sources based on surveys are limited by their sample size that precludes data on small geographical areas – and especially impacts on flow matrices – as was confirmed explicitly by Skinner et al (2013: section 5.2.4) in their report for ONS. Thus the availability of the Population Census small area data on commuting and migration flows remains an absolute pre-requisite so meaningful areas can be defined, making it possible to target local policy accurately, and deliver appropriate economic development, and study uneven growth. •	Manufacturing (still) matters to the UK economy. 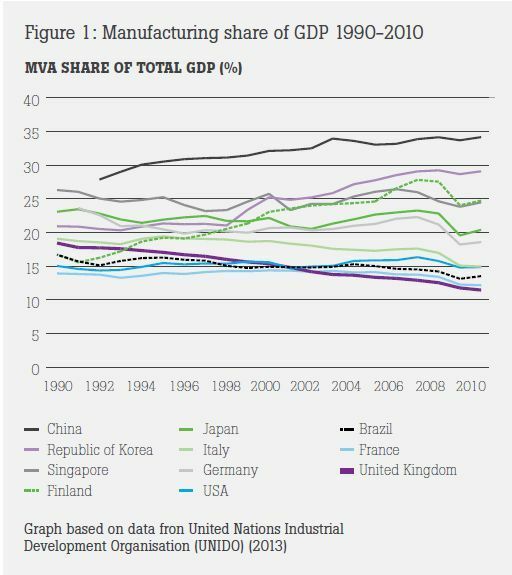 Whilst the manufacturing share of GDP has declined more rapidly than other developed economies (Figure 1), its contribution is still significant (£139 billion). But crucially, manufacturing provides proportionately more R&D, innovation, productivity growth and export activity than other sectors of the economy. •	We are entering a new era for manufacturing, where the value chain is being extended beyond the production and sales of products. For example, 39% of UK manufacturers employing over 100 people derived value from service provision in 2011. Through notions such as the servitization of products and the rise of manu-services (Sissons 2011), a reappraisal of the place of manufacturing within the economy is overdue. This will require new metrics on measuring and defining manufacturing and also raises questions over the geographical distribution (nationally and globally) of different elements of the extended value chain. •	As well as being increasingly adaptive and responsive to rapidly changing markets and technologies, it is also striking how pressures based on environmental regulation and energy pricing are reshaping the organisation and development of manufacturing. As part of the extended value chain, increasing attention is being paid to the reuse, remanufacturing, recycling and recovery of products as part of the service and role of the manufacturers (e.g. JCD are pioneers in remanufacturing products returned at the end of their lifespan). 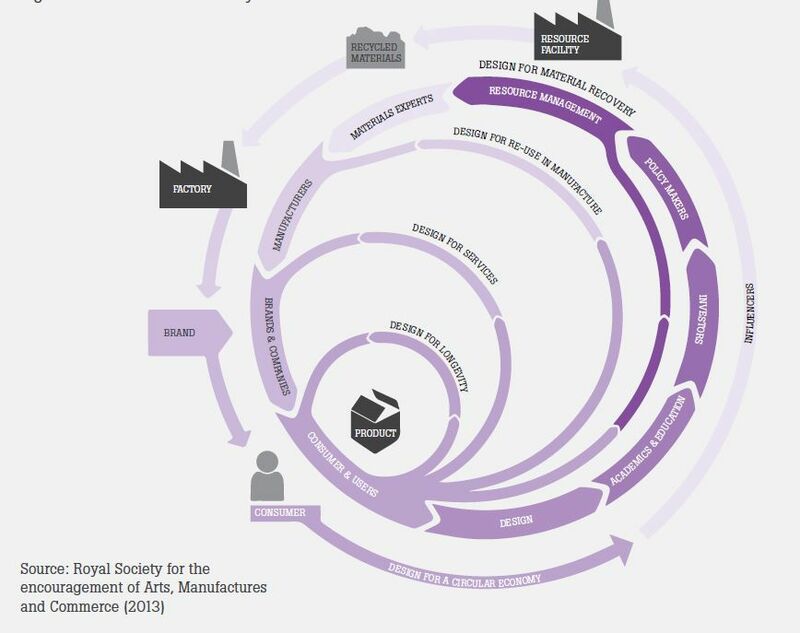 Drawing on the notion of the ‘circular economy’ (Figure 2), it’s clear that regulatory practices that increasingly ‘price the environment’ have the potential to stimulate innovation , competition and enhanced productivity within the sector. o	Rather than thinking about horizontal (e.g. competition policy) and selective policies (e.g. sector support etc), more holistic systems level approaches are needed. o	To help bring together a more integrated policy approach, the report advocated that the UK follow the US model and develop a central Office for Manufacturing to coordinate policy. Interestingly, however, the initial response from the Secretary for State appeared reticent to the development of another layer/institutional body. o	The Secretary for State argued the need for a long-term approach to supporting manufacturing which goes beyond government cycles. Quite how this would play out in reality is less clear, although it is possible the institutional architectures of Catapult Centres, MAS etc , together with the 11 sectors of industrial policy, may offer some foundations. Whilst the report focused on the manufacturing sector at the national scale, it nevertheless raises some critical issues for local and regional development. •	The Future of Manufacturing said relatively little about the opportunities and challenges for the sector across UK cities and regions. 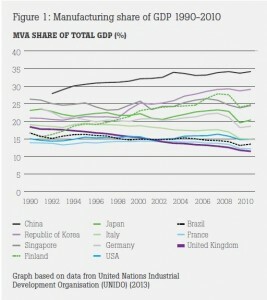 Crucially, the role of manufacturing in re-balancing the economy (sectorally and spatially) received little attention. Nevertheless, the report does recognise the role of historical and place based assets in the evolution and branching of new manufacturing activities, linking to notions of evolutionary economic geography and the rise of ‘phoenix industries’ (Christopherson 2009). Yet it remains less clear as to what policy support measures exist at the regional and sub-regional level to identify and catalyse the conversion of historical assets into new technological fields and markets. •	Whilst the drivers of ‘pricing the environment’ may spur innovation and productivity gains in some sectors, they raise critical challenges for many carbon intensive activities and businesses. Certain regions and localities are increasingly prone to the threats of ‘carbon leakage’ with firms choosing to move to lower cost localities. •	The recent development of the offshore wind sector, in particular in the North East, illustrates the significant challenges for integrating policy within a long-term systems level approach (see Dawley and Mackinnon 2013). On the one hand, August 2013 saw the belated development of an Offshore Wind Industrial Strategy for the UK. But on the other hand, and in contrast to the perceived secure future for renewable energy up until the late 2000s, we have since seen the delayed Energy Bill, uncertainty over longer-term CO2 targets and a renewed commitment to nuclear energy. In the words of Deputy Prime Minister recently, “The environment is being written off by campaign chiefs on both left and right: too expensive in hard times….On no other issue has the political establishment proved more fickle” (cited in The Times, 7/11/13 p. 11). Such shifts and delays could prove critical in the development of industrial capacity in the offshore wind sector in the UK, despite hosting the world’s largest offshore wind market.